Обновление 6.3 - "Make Love, Not War(frame)"
New game mode! Mobile Defense missions are now available. New enemy types: The Grineer Seeker with a devastating new attack. Valentine’s Day Theme – love is in the air! These are one day only, get ‘em while they're hot! Inventory screen now shows level of item. Settings screen now detects APEX support and disables the option if not supported. Pistol ammo increased for all pistol types. Balance changes for Gorgon and Hek. Shield Mods increased in power. Fixes to Spy missions and secondary objectives. Cryopod can no longer be switch-teleported. Fixes to keypass objective marker not always sticking around. Fixed being able to play the same alert multiple times. Fix for some users incorrectly receiving an error message about their graphics card. Fixes for Upgrade tree broken on some items. Fixed issue with pausing in an elevator. Jackal will now spawn if players run in to the elevator pit before encounter has started. Fix for VoIP breaking after one match. Potential fix for Jackal stomp loop. Fixes for packet drops breaking contact list. SCINDO and FRAGO added to the Market. 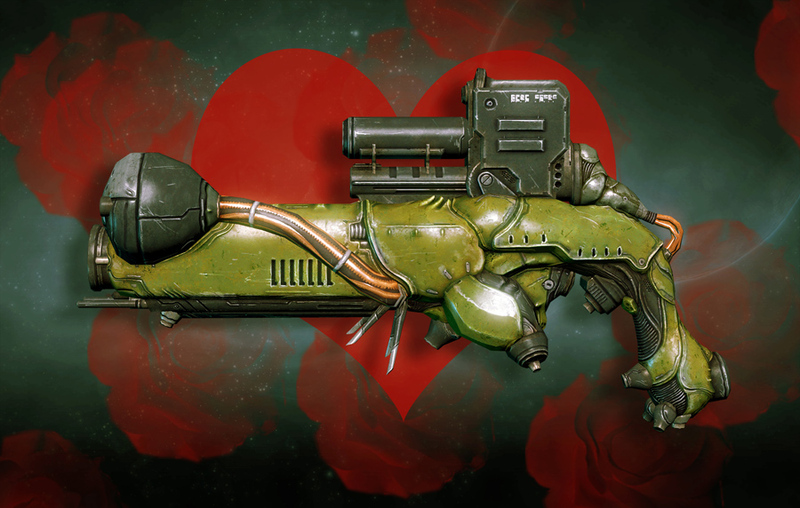 Slow, powerful, multi-hit weapons for lovers of heavy-metal! Ember model has had a revamp on its mesh and materials. Balancing changed for Energy Siphon cards, Mods with shield, energy, and health bonuses will be additive for more sane stacking. Small improvements to stat displays for upgrades and projectile-based weapons. Settings improvements for mouse sensitivity, brightness, contrast and UPnP. Alerts only require node unlock vs. region. Faster UI response to new Alerts. Improvements to selling UI to reduce accidental selling of important items. Balance changes to Mod resale and rarity. Infested Disruptor color effects toned down. Balance changes to Boss scaling with four players. Reduced frequency of mission key wrinkle. Players are now prompted before removing a friend. Fixed Matchmaking problems related to overzealous filtering. Expanded Matchmaking search to include nearby regions if no games found. Fixed duplicate Artifact cards taking up space on interface. Fixed pass-key loss when a player leaves the session while holding it. VOIP fixes for Contacts list. Fixed hangs related to slow UPnP updates. Fixed join session from Contacts. Several crashes in DirectX11, Physics, Networking, Input and Updating code. Fixed a few cases of players exiting the level and falling into space. Fixed Datamass loss after extended period of time. Mod effects show up properly on Dual Skanas and Furax. Fixed loss of Mastery when selling an item. Equipped consumables are no longer deleted when spending a revive. Fixed Bolto and powers inflating player weapon accuracy. Fixed controller vibration not toggling off. Overheat moved to second ability, acts as a shield and radial damage power. Fireball is now properly attached to the target and doing damage over time. World on Fire has been boosted: it now cycles through nearby targets to immolate! Warframe Blueprints for Excalibur, Volt and Loki. Weapon Blueprints for Afuris and Bolto. More localization updates from our amazing volunteers! Pro system dropped, new Super-Charge requires an item to be installed. Items can be purchased with Platinum (same cost as before) or built in the Foundry. Users with Pro items will have this automatically installed for them. More Blueprint rewards added to Alerts including Orokin Reactors and Catalysts used to Super-Charge Warframes and weapons. Как познавательно... У нас англоязычный сайт?